Time is an abstract concept that is better understood when mapped onto space. For English speakers, typically a timeline is used that runs horizontally from left (past) to right (future) (Boroditsky, Fuhrman, & McCormick, 2011). However, it is unclear from prior research how the two regions along the timeline are differentiated. In addition, it is unclear whether the left/right axis corresponds to a primary conceptualization of time onto space. Indeed, there is a prevalence of gestures and metaphors that conceptualize the past as behind and the future as ahead, implicating use of the front/back axis. 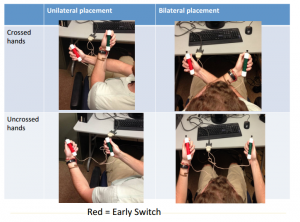 In our experiments, participants make temporal judgments of pictures while holding their hands in various positions around their bodies to assess a) whether the body or hands or both are used as an anchor to differentiate regions; and b) whether the front/back axis can be used as a timeline. We have found independent influences of the body and the hands in anchoring the left/right axis. 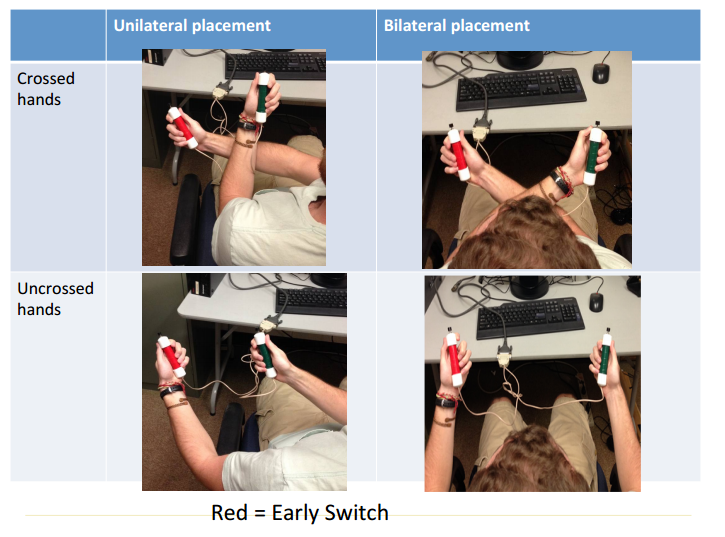 We have also found support for the use of the front/back axis for mapping time, as well as independent influences of the body and the hands in anchoring the front/back axis. We have also conducted experiments that focus on the scale parameter of a spatial reference frame. We change the temporal scale across trials, and illustrate that the scale parameter is set, as evidenced by a cost when the parameter value changes. We have also examined the correspondence between the spatial scale and the temporal scale, requiring participants to map short or long temporal spans to close or far spatial distances. The results illustrate flexibility in this mapping.